2016 has been a great year for Influential as growth continued throughout Q1 and Q2. This period has seen a number of changes including taking on New Specialist Staff. We launched our long awaited Data Management and BI tool Atlas Publishing Intelligence. Our BI and Development teams also got to work with new software such as Microsoft’s SharePoint 2016 Server and updates to industry leading tools such as SAP’s BusinessObjects BI Analytics Suite and the latest version of IBM’s Cognos Analytics (v11). We are also pleased to welcome a number of business clients across the Influential group. The businesses range from growing SME’s and start-ups to recognised global brands and UK institutions. 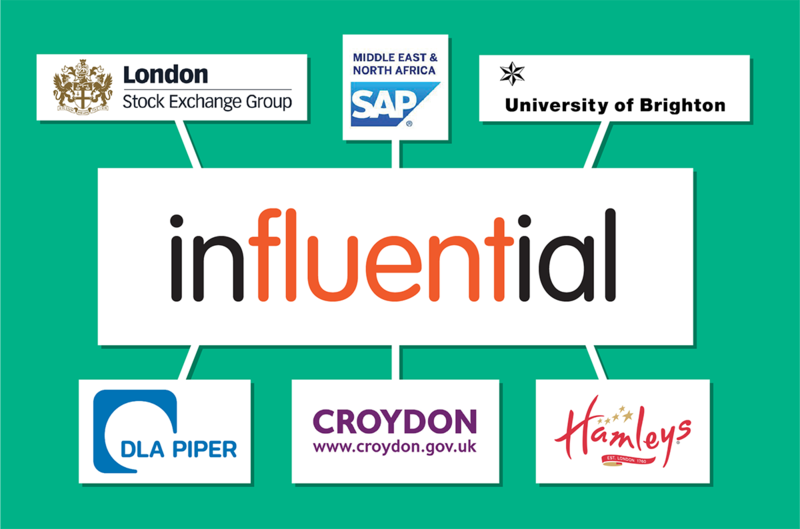 These include London Stock Exchange Group, DLA Piper Global Law Firm, Croydon Council, SAP Middle East and North Africa, Hamleys of London and the University of Brighton. The London Stock Exchange Group is a global leader in developing and operating high-performance technology solutions. This includes trading, market surveillance and post-trade systems for over 40 organisations and exchanges. Bringing together companies seeking capital with investors from around the world. Additional services include network connectivity, hosting and quality assurance testing. The Groups technology companies also include Exactpro, MillenniumIT and GATElab. Businesses depending on technology that is secure, stable and performs to high levels of availability and throughput. Providing agile, efficient, in-house IT development capability. With Europe the Primary market, the London Stock Exchange Group headquarters are in London. There are also significant operations in North America, Italy, France and Sri Lanka. Employing around 3,500 people, LSEG has a long and prestigious history that can be traced back to 1698. A leading global law firm, DLA Piper clients include multinational, Global 1000, Fortune 500, over half the Fortune 250 and almost half of the FTSE 350 or their subsidiaries. Not just limited to major corporations, they proudly drive innovation working with businesses of all sizes including companies developing industry-leading technologies. They also advise governments and public sector bodies. The business has an extensive geographic reach with lawyers located in over 30 countries throughout the world including the Europe, the Middle East, the Americas, Africa and Asia Pacific. This enables the practice to look after the business issues that matter to its clients, whatever the business size, wherever they are in the world. DLA Piper’s teams of expert lawyers covering a wide range of services and are a significant corporate operator in the UK. Their specialist practices offer leading advice and services in many areas, including Corporate, Employment,Litigation and regulatory, Real estate practice, Restructuring and Insolvency and Tax. SAP Middle East and North Africa (MENA) is a subsidiary of SAP SE and seen as one of the fastest growing markets for SAP globally. With over 1350+ customers, 1600 qualified SAP consultants and 120 business partners SAP MENA continues to build capacity throughout the ecosystem and into 16 countries across the region. Established in late 2007, SAP MENA has continued to expand operations ever since, growing to have 12 offices across the region; Saudi (3), Oman, Kuwait, Bahrain, Qatar, Pakistan, Cairo and Dubai (2) where it also has a regional Training and Development Institute. SAP is a market leader in enterprise application software. Their aim is to help all sizes of organisations and industries generate new opportunities for innovation and growth, and stay ahead of the competition. Hamleys is known as the oldest toy shop in the world and remains one of the world’s best-known retailers of toys. Founded in London in 1760 by William Hamley, the company has brought ‘smiles and laughter to children’ for over 255 years. Hamleys moved to its current Regent Street flagship store in 1881 and has become one of London’s major tourist attractions. Set over seven floors and with more than 50,000 toys on sale. With ten other outlets in the UK and almost 50 international franchises, Hamleys is known and trusted all over the world.As well as toys and their history, Hamleys are proud to value and invest in their people, whose talent they believe will continue to grow the company. Hamleys are also committed to having a positive impact both locally and globally, improving the environment that children grow up in by driving recycling, encouraging sustainability and through other charitable work. The University of Brighton has been a key part of Brighton since 1859. Based over 5 campuses in Brighton, Eastbourne and Hastings the university now has 20,700 students and 2,700 staff employed across the south coast and beyond. Through it’s and it’s community works the University works hard to demonstrate civic responsibility across the region. Guided by the founding ethos to become the diverse, multidisciplinary institution it strives to be socially relevant, becoming a trusted partner within the local and global community. The University is regarded as a leading university for the professions, particularly medicine, nursing, engineering and pharmacy. Croydon Council is the largest employer in the borough of London with a workforce of about 10,500 staff, which includes schoolteachers. With an annual spend of over £900 million per year the council is a real boost for the local economy. The council provides a large and varied number of services for local people, businesses and visitors to the borough over 24 electoral wards. Looking for Business Intelligence, Web Development or IT Support Services? Talk to Influential today about your ideal business solution.